The Grand Traverse Insider ran a feature under the headline "Real People In Real Times". You can read the entire article at this Grand Traverse Insider link, or by clicking the pdf link above. The article was also reprinted here by stpaddy.net, and by gameninecraft.us. Unlike most history books, which simply recount dates and information, 'ClanDonnell' tells the story of an Irish clan through a collection of true stories. McDonnell hopes the format will appeal to everyone and not just history buffs. A Detroit native and former attorney, McDonnell and his wife spent years vacationing in northern Michigan before relocating to Torch Lake Township after their retirement. Throughout the years he researched and wrote histories of his family to help him answer two questions. As he researched and answered those questions for himself, McDonnell realized that other Irish-Americans asked the same questions. 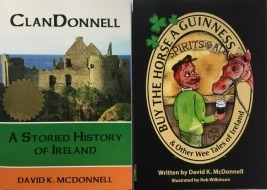 That inspired him to write 'ClanDonnell: A Storied History of Ireland,' a collection of true stories that tells the story of the Donnell clan.